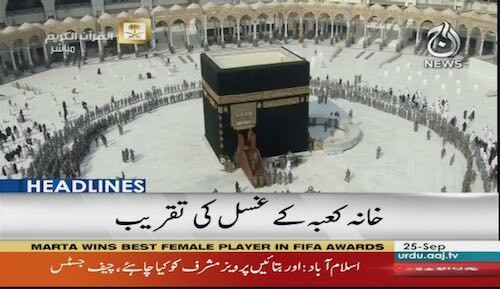 Ghusl-e-Kaaba ceremony was held at Masjid al-Haram in Saudi Arabia on Sunday. The practice was performed by Makkah’s Governor Prince Khalid al-Faisal. Head of the caretaker family of Kaaba, Sheikh Saleh bin Zain-ul-Abdeen Al Shaibi told that Kaaba was washed with 45 litres Zamzam water after Fajr prayer.